I'm a Porsche guy. Seen it all, done it all. Dyed in the wool. BUT, a cheap Porsche guy. Couple 911's, a 914-4 (still have) and a 924. I'm trying to build a tribute to every car I've owned, and it includes Dodges, VW's Audis, Mercury and a Lincoln ( I like diversity). So, I recently came by a 1977 1/12 scale 924. Built by the PO 40 years ago, and fairly well built. I'll strip it and make it my own. But, for some reason the rear tires have severe flat spots. Any thoughts on how to bring them back. Appear to be vinyl and 1 piece. Is it flat spots where the tires have rested on the "ground" or is it random flat spots? I assume the vinyl tires are hollow? They would need to be reinforced from the inside somehow to prevent them from getting flat spots again. 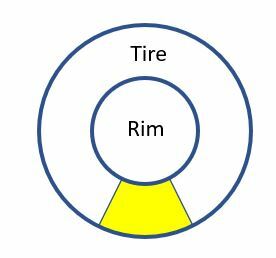 A car tire has a flat spot due to the weight of the car, the issue is the size of the flat area, since there is no air pressure in those vinyl tires the flat spot can't be adjusted that way either. If it is a flat spot due to "ground" contact then maybe you could make a filler/support that fits between the rim and the inside of the tire. Something like the yellow part below. The outer profile could be given a flat spot if you want the model to look more natural and not like a ballet dancer standing on her toe tips. I suggest painting the areas where styrene touches vinyl with some enamel or laquer paint to prevent softener from the vinyl leaking into the styrene. Make a few styrene discs and cut into segments. Thanks for the response. Rims are unaffected by the softener. I'll try the internal disc approach. The car has been sitting in one place for nearly 40 years. I may also try to search for replacement tires. BTW, my 1:1 scale 72 Porsche 914 also has flat spots from not being driven for a few years. They have zero miles on them, but that will change in the spring.